แม่แบบ:Double image stack วิตามินซี (อังกฤษ: Vitamin C) หรือ L-ascorbic acid is an essential nutrient for humans, in which it functions as a vitamin. Ascorbate (an ion of ascorbic acid) is required for a range of essential metabolic reactions in all animals and plants. It is made internally by almost all organisms; notable mammalian exceptions are most or all of the order chiroptera (bats), and the entire suborder Anthropoidea (Haplorrhini) (tarsiers, monkeys and apes). It is also needed by guinea pigs and some species of birds and fish. Deficiency in this vitamin causes the disease scurvy in humans. It is also widely used as a food additive. The pharmacophore of vitamin C is the ascorbate ion. In living organisms, ascorbate is an anti-oxidant, since it protects the body against oxidative stress, and is a cofactor in several vital enzymatic reactions. Scurvy has been known since ancient times. People in many parts of the world assumed it was caused by a lack of fresh plant foods. The British Navy started giving sailors lime juice to prevent scurvy in 1795. 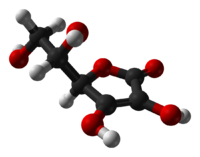 Ascorbic acid was finally isolated in 1933 and synthesized in 1934. The uses and recommended daily intake of vitamin C are matters of on-going debate, with RDI ranging from 45 to 95 mg/day. Proponents of megadosage propose from 200 to upwards of 2000 mg/day. A recent meta-analysis of 68 reliable antioxidant supplementation experiments, involving a total of 232,606 individuals, concluded that consuming additional ascorbate from supplements may not be as beneficial as thought. Vitamin C is purely the L-enantiomer of ascorbate; the opposite D-enantiomer has no physiological significance. Both forms are mirror images of the same molecular structure. When L-ascorbate, which is a strong reducing agent, carries out its reducing function, it is converted to its oxidized form, L-dehydroascorbate. L-dehydroascorbate can then be reduced back to the active L-ascorbate form in the body by enzymes and glutathione. During this process semidehydroascorbic acid radical is formed. Ascorbate free radical reacts poorly with oxygen, and thus, will not create a superoxide. Instead two semidehydroascorbate radicals will react and form one ascorbate and one dehydroascorbate. With the help of glutathione, dehydroxyascorbate is converted back to ascorbate. The presence of glutathione is crucial since it spares ascorbate and improves antioxidant capacity of blood. Without it dehydroxyascorbate could not convert back to ascorbate. L-ascorbate is a weak sugar acid structurally related to glucose which naturally occurs either attached to a hydrogen ion, forming ascorbic acid, or to a metal ion, forming a mineral ascorbate. The vast majority of animals and plants are able to synthesize their own vitamin C, through a sequence of four enzyme-driven steps, which convert glucose to vitamin C. The glucose needed to produce ascorbate in the liver (in mammals and perching birds) is extracted from glycogen; ascorbate synthesis is a glycogenolysis-dependent process. In reptiles and birds the biosynthesis is carried out in the kidneys. Among the animals that have lost the ability to synthesise vitamin C are simians (specifically the suborder haplorrhini, which includes humans), guinea pigs, a number of species of passerine birds (but not all of them—there is some suggestion that the ability was lost separately a number of times in birds), and many (probably all) major families of bats, including major insect and fruit-eating bat families. These animals all lack the L-gulonolactone oxidase (GULO) enzyme, which is required in the last step of vitamin C synthesis, because they have a defective form of the gene for the enzyme (Pseudogene ΨGULO). Some of these species (including humans) are able to make do with the lower levels available from their diets by recycling oxidised vitamin C.
An adult goat, a typical example of a vitamin C-producing animal, will manufacture more than 13 g of vitamin C per day in normal health and the biosynthesis will increase "many fold under stress". Trauma or injury has also been demonstrated to use up large quantities of vitamin C in humans. Some microorganisms such as the yeast Saccharomyces cerevisiae have been shown to be able to synthesize vitamin C from simple sugars. Venturi and Venturi suggested that the antioxidant action of ascorbic acid developed firstly in plant kingdom when, about 500 Mya, plants began to adapting themselves to mineral deficient fresh-waters of estuary of rivers. Some biologists suggested that many vertebrates had developed their metabolic adaptive strategies in estuary environment. In this theory, some 400-300 million years ago when living plants and animals first began the move from the sea to rivers and land, environmental iodine deficiency was a challenge to the evolution of terrestrial life. In plants, animals and fishes, the terrestrial diet became deficient in many essential marine micronutrients, including iodine, selenium, zinc, copper, manganese, iron, etc. Freshwater algae and terrestrial plants, in replacement of marine antioxidants, slowly optimized the production of other endogenous antioxidants such as ascorbic acid, polyphenols, carotenoids, flavonoids, tocopherols etc., some of which became essential “vitamins” in the diet of terrestrial animals (vitamins C, A, E, etc.). Ascorbic acid or vitamin C is a common enzymatic cofactor in mammals used in the synthesis of collagen. Ascorbate is a powerful reducing agent capable of rapidly scavenging a number of reactive oxygen species (ROS). Freshwater teleost fishes also require dietary vitamin C in their diet or they will get scurvy (Hardie et al.,1991). The most widely recognized symptoms of vitamin C deficiency in fishes are scoliosis, lordosis and dark skin coloration. Terrestrial freshwaters salmonids also show impaired collagen formation, internal/fin haemorrhage, spinal curvature and increased mortality. If these fishes are housed in seawater with algae and phytoplankton, then vitamin supplementation seems to be less important, presumably because of the availability of other, more ancient, antioxidants in natural marine environment. Some scientists have suggested that the loss of human ability to make vitamin C may have caused a rapid simian evolution into modern man. However, the loss of ability to make vitamin C in simians must have occurred much further back in evolutionary history than the emergence of humans or even apes, since it evidently occurred sometime after the split in the Haplorrhini (which cannot make vitamin C) and its sister clade which retained the ability, the Strepsirrhini ("wet-nosed" primates). These two branchs parted ways about 63 million years ago (Mya). Approximately 5 million years later (58 Mya), only a short time afterward from an evolutionary perspective, the infraorder Tarsiiformes, whose only remaining family is that of the tarsier (Tarsiidae), branched off from the other haplorrhines. Since tarsiers also cannot make vitamin C, this implies the mutation had already occurred, and thus must have occurred between these two marker points (63 to 58 Mya). It has been noted that the loss of the ability to synthesize ascorbate strikingly parallels the evolutionary loss of the ability to break down uric acid. Uric acid and ascorbate are both strong reducing agents. This has led to the suggestion that in higher primates, uric acid has taken over some of the functions of ascorbate. Ascorbic acid can be oxidized (broken down) in the human body by the enzyme L-ascorbate oxidase. Ascorbic acid is absorbed in the body by both active transport and simple diffusion. Sodium Dependent Active Transport - Sodium-Ascorbate Co-Transporters (SVCTs) and Hexose transporters (GLUTs) are the two transporters required for absorption. SVCT1 and SVCT2 imported the reduced form of ascorbate across plasma membrane. GLUT1 and GLUT3 are the two glucose transporters and only transfer dehydroascorbic acid form of Vitamin C. Although dehydroascorbic acid is absorbed in higher rate than ascorbate, the amount of dehydroascorbic acid found in plasma and tissues under normal conditions is low, as cells rapidly reduce dehydroascorbic acid to ascorbate. Thus, SVCTs appear to be the predominant system for vitamin C transport in the body. SVCT2 is involved in vitamin C transport in almost every tissue, the notable exception being red blood cells which lose SVCT proteins during maturation. Knockout animals for SVCT2 die shortly after birth, suggesting that SVCT2-mediated vitamin C transport is necessary for life. With regular intake the absorption rate varies between 70 to 95%. However, the degree of absorption decreases as intake increases. At high intake (12g), human body can absorb ascorbic acid as low as 16%; while, at low intake (<20 mg) the absorption rate could reach up to 98%. Biological tissues that accumulate over 100 times the level in blood plasma of vitamin C are the adrenal glands, pituitary, thymus, corpus luteum, and retina. Those with 10 to 50 times the concentration present in blood plasma include the brain, spleen, lung, testicle, lymph nodes, liver, thyroid, small intestinal mucosa, leukocytes, pancreas, kidney and salivary glands. Scurvy is an avitaminosis resulting from lack of vitamin C, since without this vitamin, the synthesised collagen is too unstable to perform its function. Scurvy leads to the formation of liver spots on the skin, spongy gums, and bleeding from all mucous membranes. The spots are most abundant on the thighs and legs, and a person with the ailment looks pale, feels depressed, and is partially immobilized. In advanced scurvy there are open, suppurating wounds and loss of teeth and, eventually, death. The human body can store only a certain amount of vitamin C, and so the body soon depletes itself if fresh supplies are not consumed. It has been shown that smokers who have diets poor in vitamin C are at a higher risk of lung-borne diseases than those smokers who have higher concentrations of vitamin C in the blood. Nobel prize winner Linus Pauling and Dr. G. C. Willis have asserted that chronic long term low blood levels of vitamin C or Chronic Scurvy is a cause of atherosclerosis. Western societies generally consume sufficient Vitamin C to prevent scurvy. In 2004 a Canadian Community health survey reported that Canadians of 19 years and above have intakes of vitamin C from food of, 133 mg/d for males and 120 mg/d for females, which is higher than the RDA recommendation. The need to include fresh plant food or raw animal flesh in the diet to prevent disease was known from ancient times. Native peoples living in marginal areas incorporated this into their medicinal lore. For example, spruce needles were used in temperate zones in infusions, or the leaves from species of drought-resistant trees in desert areas. In 1536, the French explorer Jacques Cartier, exploring the St. Lawrence River, used the local natives' knowledge to save his men who were dying of scurvy. He boiled the needles of the arbor vitae tree to make a tea that was later shown to contain 50 mg of vitamin C per 100 grams. Throughout history, the benefit of plant food to survive long sea voyages has been occasionally recommended by authorities. John Woodall, the first appointed surgeon to the British East India Company, recommended the preventive and curative use of lemon juice in his book "The Surgeon's Mate", in 1617. The Dutch writer, Johann Bachstrom, in 1734, gave the firm opinion that "scurvy is solely owing to a total abstinence from fresh vegetable food, and greens; which is alone the primary cause of the disease." While the earliest documented case of scurvy was described by Hippocrates around the year 400 BC, the first attempt to give scientific basis for the cause of this disease was by a ship's surgeon in the British Royal Navy, James Lind. Scurvy was common among those with poor access to fresh fruit and vegetables, such as remote, isolated sailors and soldiers. While at sea in May 1747, Lind provided some crew members with two oranges and one lemon per day, in addition to normal rations, while others continued on cider, vinegar, sulfuric acid or seawater, along with their normal rations. In the history of science this is considered to be the first occurrence of a controlled experiment comparing results on two populations of a factor applied to one group only with all other factors the same. The results conclusively showed that citrus fruits prevented the disease. Lind published his work in 1753 in his Treatise on the Scurvy. Lind's work was slow to be noticed, partly because his Treatise was not publish until six years after his study, and also because he recommended a lemon juice extract known as "rob". Fresh fruit was very expensive to keep on board, whereas boiling it down to juice allowed easy storage but destroyed the vitamin (especially if boiled in copper kettles). Ship captains concluded wrongly that Lind's other suggestions were ineffective because those juices failed to prevent or cure scurvy. It was 1795 before the British navy adopted lemons or lime as standard issue at sea. Limes were more popular as they could be found in British West Indian Colonies, unlike lemons which weren't found in British Dominions, and were therefore more expensive. This practice led to the American use of the nickname "limey" to refer to the British. Captain James Cook had previously demonstrated and proven the principle of the advantages of carrying "Sour krout" on board, by taking his crews to the Hawaiian Islands and beyond without losing any of his men to scurvy. For this otherwise unheard of feat, the British Admiralty awarded him a medal. The name "antiscorbutic" was used in the eighteenth and nineteenth centuries as general term for those foods known to prevent scurvy, even though there was no understanding of the reason for this. These foods included but were not limited to: lemons, limes, and oranges; sauerkraut, cabbage, malt, and portable soup. In 1907, Axel Holst and Theodor Frølich, two Norwegian physicians studying beriberi contracted aboard ship's crews in the Norwegian Fishing Fleet, wanted a small test mammal to substitute for the pigeons they used. They fed guinea pigs their test diet, which had earlier produced beriberi in their pigeons, and were surprised when scurvy resulted instead. Until that time scurvy had not been observed in any organism apart from humans, and had been considered an exclusively human disease. Albert Szent-Györgyi, pictured here in 1948, was awarded the 1937 Nobel Prize in Medicine "for his discoveries in connection with the biological combustion processes, with special reference to vitamin C and the catalysis of fumaric acid". He also identified many components and reactions of the citric acid cycle independently from Hans Adolf Krebs. In 1912, the Polish-American biochemist Casimir Funk, while researching deficiency diseases, developed the concept of vitamins to refer to the non-mineral micro-nutrients which are essential to health. The name is a blend of "vital", due to the vital role they play biochemically, and "amines" because Funk thought that all these materials were chemical amines. One of the "vitamines" was thought to be the anti-scorbutic factor, long thought to be a component of most fresh plant material. From 1928 to 1933, the Hungarian research team of Joseph L Svirbely and Albert Szent-Györgyi and, independently, the American Charles Glen King, first isolated the anti-scorbutic factor, calling it "ascorbic acid" for its vitamin activity. Ascorbic acid turned out not to be an amine, nor even to contain any nitrogen. For their accomplishment, Szent-Györgyi was awarded the 1937 Nobel Prize in Medicine "for his discoveries in connection with the biological combustion processes, with special reference to vitamin C and the catalysis of fumaric acid". Between 1933 and 1934, the British chemists Sir Walter Norman Haworth and Sir Edmund Hirst and, independently, the Polish chemist Tadeus Reichstein, succeeded in synthesizing the vitamin, making it the first to be artificially produced. This made possible the cheap mass-production of what was by then known as vitamin C. Only Haworth was awarded the 1937 Nobel Prize in Chemistry for this work, but the "Reichstein process" retained Reichstein's name. In 1933 Hoffmann–La Roche became the first pharmaceutical company to mass-produce synthetic vitamin C, under the brand name of Redoxon. In 1957 the American J.J. Burns showed that the reason some mammals were susceptible to scurvy was the inability of their liver to produce the active enzyme L-gulonolactone oxidase, which is the last of the chain of four enzymes which synthesize vitamin C. American biochemist Irwin Stone was the first to exploit vitamin C for its food preservative properties. He later developed the theory that humans possess a mutated form of the L-gulonolactone oxidase coding gene. In 2008 researchers at the University of Montpellier discovered that in humans and other primates the red blood cells have evolved a mechanism to more efficiently utilize the vitamin C present in the body by recycling oxidized L-dehydroascorbic acid (DHA) back into ascorbic acid which can be reused by the body. The mechanism was not found to be present in mammals that synthesize their own vitamin C.
แม่แบบ:Confusing Ascorbic acid performs numerous physiological functions in human body. These functions include the synthesis of collagen, carnitine and neurotransmitters, the synthesis and catabolism of tyrosine and the metabolism of microsome. Ascorbate acts as a reducing agent (i.e. electron donor, anti-oxidant) in the above-described syntheses, maintaining iron and copper atoms in their reduced states. Three participate in collagen hydroxylation. These reactions add hydroxyl groups to the amino acids proline or lysine in the collagen molecule via prolyl hydroxylase and lysyl hydroxylase, both requiring vitamin C as a cofactor. Hydroxylation allows the collagen molecule to assume its triple helix structure and making vitamin C essential to the development and maintenance of scar tissue, blood vessels, and cartilage. 2 are necessary for synthesis of carnitine. Carnitine is essential for the transport of fatty acids into mitochondria for ATP generation. dopamine beta hydroxylase participates in the biosynthesis of norepinephrine from dopamine. another enzyme adds amide groups to peptide hormones, greatly increasing their stability. Ascorbic acid is well known for its antioxidant activity. Ascorbate acts as a reducing agent to reverse oxidation in aqueous solution. When there are more free radicals (Reactive oxygen species) in the body versus antioxidant, a human is under the condition called Oxidative stress. Oxidative stress induced diseases encompass cardiovascular diseases, hypertension, chronic inflammatory diseases and diabetes The plasma ascorbate concentration in oxidative stress patient (less than 45 µmol/L) measured is lower than healthy individual (61.4-80 µmol/L) According to McGregor and Biesalski (2006). increasing plasma ascorbate level may have therapeutic effects in oxidative stress individual. Individuals with oxidative stress and healthy individuals have different pharmacokinetics of ascorbate. Ascorbic acid behaves not only as antioxidant but also as pro-oxidant. Ascorbic acid reduced transition metals, such as cupric ions (Cu2+) to cuprous (Cu1+) and ferric ions (Fe3+) to ferrous (Fe2+) during conversion from ascorbate to dehydroxyascorbate In Vitro/ This reaction can generate superoxide and other ROS. However, in the body, free transition elements are unlikely to be present while iron and copper is bound to diverse proteins. Recent studies show that intravenous injection of 7.5g of ascorbate daily for six days did not increase pro-oxidant markers; thus, ascorbate as a pro-oxidant is unlikely to convert metals to create ROS in vivo. The North American Dietary Reference Intake recommends 90 milligrams per day and no more than 2 grams per day (2000 milligrams per day). Other related species sharing the same inability to produce vitamin C and requiring exogenous vitamin C consume 20 to 80 times this reference intake. There is continuing debate within the scientific community over the best dose schedule (the amount and frequency of intake) of vitamin C for maintaining optimal health in humans. It is generally agreed that a balanced diet without supplementation contains enough vitamin C to prevent scurvy in an average healthy adult, while those who are pregnant, smoke tobacco, or are under stress require slightly more. High doses (thousands of milligrams) may result in diarrhea in healthy adults. Proponents of alternative medicine (specifically orthomolecular medicine) claim the onset of diarrhea to be an indication of where the body’s true vitamin C requirement lies, though this has yet to be clinically verified. 60–95 milligrams per day: United States' National Academy of Sciences. The United States defined Tolerable Upper Intake Level for a 25-year-old male is 2,000 milligrams per day. 400 milligrams per day: the Linus Pauling Institute. 500 milligrams per 12 hours: Professor Roc Ordman, from research into biological free radicals. 3,000 milligrams per day (or up to 30,000 mg during illness): the Vitamin C Foundation. 6,000–12,000 milligrams per day: Thomas E. Levy, Colorado Integrative Medical Centre. 6,000–18,000 milligrams per day: Linus Pauling's personal use. Vitamin C is necessary for the treatment and prevention of scurvy. Scurvy is commonly comorbid with other diseases of malnutrition; sufficient vitamin C to prevent scurvy occurs in most diets in industrialized nations. Vitamin C functions as an antioxidant. Adequate intake is necessary for health, but supplementation is probably not necessary in most cases. Based on animal and epidemiological models, high doses of vitamin C may have "protective effects" on lead-induced nerve and muscle abnormalities, especially in smokers. Dehydroascorbic acid, the main form of oxidized vitamin C in the body, may reduce neurological deficits and mortality following stroke due to its ability to cross the blood-brain barrier, while "the antioxidant ascorbic acid (AA) or vitamin C does not penetrate the blood-brain barrier". Vitamin C's effect on the common cold has been extensively researched. Evidence however does not support its use. Several individuals and organizations advocate large doses of vitamin C based on in vitro and retrospective studies, although large, randomized clinical trials on the effects of high doses on the general population have never taken place. Individuals who have recommended intake well in excess of the current Dietary Reference Intake (DRI) include Robert Cathcart, Ewan Cameron, Steve Hickey, Irwin Stone, Matthias Rath and Linus Pauling. Arguments for megadosage are based on the diets of closely related apes and the likely diet of pre-historical humans, and that most mammals synthesize vitamin C rather than relying on dietary intake. Stone and Pauling calculated, based on the diet of primates (similar to what our common ancestors are likely to have consumed when the gene mutated), that the optimum daily requirement of vitamin C is around 2,300 milligrams for a human requiring 2,500 kcal a day. Pauling also criticized the established RDA as sufficient to prevent scurvy, but not necessarily the dosage for optimal health. Higher vitamin C intake reduces serum uric acid levels, and is associated with lower incidence of gout. Vitamin C has also been promoted as efficacious against a vast array of diseases and syndromes. Variously, adequate dietary intake, oral megadose, or intravenous injection may be required for the purported benefits. These disorders include: the common cold, pneumonia, bird flu, SARS, heart disease, AIDS, autism, low sperm count, age-related macular degeneration, altitude sickness, pre-eclampsia, amyotrophic lateral sclerosis, asthma, tetanus, and cancer. These uses are poorly supported by the evidence, and sometimes contraindicated. Simple tests use DCPIP to measure the levels of vitamin C in the urine and in serum or blood plasma. However these reflect recent dietary intake rather than the level of vitamin C in body stores. Reverse phase high performance liquid chromatography is used for determining the storage levels of vitamin C within lymphocytes and tissue. It has been observed that while serum or blood plasma levels follow the circadian rhythm or short term dietary changes, those within tissues themselves are more stable and give a better view of the availability of ascorbate within the organism. However, very few hospital laboratories are adequately equipped and trained to carry out such detailed analyses, and require samples to be analyzed in specialized laboratories. Relatively large doses of vitamin C may cause indigestion, particularly when taken on an empty stomach. When taken in large doses, vitamin C causes diarrhea in healthy subjects. In one trial, doses up to 6 grams of ascorbic acid were given to 29 infants, 93 children of preschool and school age, and 20 adults for more than 1400 days. With the higher doses, toxic manifestations were observed in five adults and four infants. The signs and symptoms in adults were nausea, vomiting, diarrhea, flushing of the face, headache, fatigue and disturbed sleep. The main toxic reactions in the infants were skin rashes. There is a longstanding belief among the mainstream medical community that vitamin C causes kidney stones, which is based on little science. Although recent studies have found a relationship, a clear link between excess ascorbic acid intake and kidney stone formation has not been generally established. Some case reports exist for patients with oxalate deposits and a history of high dose vitamin C usage. Discussions of a possible link are given in articles such as . Recent rat and human studies suggest that adding Vitamin C supplements to an exercise training program can cause a decrease in mitochondria production, hampering endurance capacity. As discussed previously, vitamin C exhibits remarkably low toxicity. The LD50 (the dose that will kill 50% of a population) in rats is generally accepted to be 11.9 grams per kilogram of body weight when taken orally. The LD50 in humans remains unknown, owing to medical ethics that preclude experiments which would put patients at risk of harm. However, as with all substances tested in this way, the LD50 is taken as a guide to its toxicity in humans and no data to contradict this has been found. While plants are generally a good source of vitamin C, the amount in foods of plant origin depends on: the precise variety of the plant, the soil condition, the climate in which it grew, the length of time since it was picked, the storage conditions, and the method of preparation. 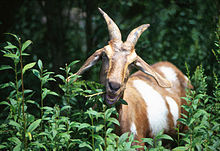 Goats, like almost all animals, make their own vitamin C. An adult goat, weighting approx. 70kg, will manufacture more than 13,000 mg of vitamin C per day in normal health, and levels manyfold higher when faced with stress. The overwhelming majority of species of animals and plants synthesise their own vitamin C, making some, but not all, animal products, sources of dietary vitamin C.
Vitamin C is most present in the liver and least present in the muscle. Since muscle provides the majority of meat consumed in the western human diet, animal products are not a reliable source of the vitamin. Vitamin C is present in mother's milk and, in lower amounts, in raw cow's milk, with pasteurized milk containing only trace amounts. All excess vitamin C is disposed of through the urinary system. Another cause of vitamin C being lost from food is leaching, where the water-soluble vitamin dissolves into the cooking water, which is later poured away and not consumed. However, vitamin C doesn't leach in all vegetables at the same rate; research shows broccoli seems to retain more than any other. Research has also shown that fresh-cut fruits don't lose significant nutrients when stored in the refrigerator for a few days. Vitamin C is widely available in the form of tablets and powders. The Redoxon brand, launched in 1934 by Hoffmann-La Roche, was the first mass-produced synthetic vitamin C.
Vitamin C is the most widely taken dietary supplement. It is available in many forms including caplets, tablets, capsules, drink mix packets, in multi-vitamin formulations, in multiple antioxidant formulations, and crystalline powder. Timed release versions are available, as are formulations containing bioflavonoids such as quercetin, hesperidin and rutin. Tablet and capsule sizes range from 25 mg to 1500 mg. Vitamin C (as ascorbic acid) crystals are typically available in bottles containing 300 g to 1 kg of powder (a teaspoon of vitamin C crystals equals 5,000 mg). Research is underway at the Scottish Crop Research Institute in the interest of creating a strain of yeast that can synthesise vitamin C in a single fermentation step from galactose, a technology expected to reduce manufacturing costs considerably. World production of synthesised vitamin C is currently estimated at approximately 110,000 tonnes annually. Main producers have been BASF/Takeda, DSM, Merck and the China Pharmaceutical Group Ltd. of the People's Republic of China. China is slowly becoming the major world supplier as its prices undercut those of the US and European manufacturers. By 2008 only the DSM plant in Scotland remained operational outside the strong price competition from China. 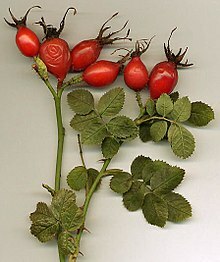 The world price of vitamin C rose sharply in 2008 partly as a result of rises in basic food prices but also in anticipation of a stoppage of the two Chinese plants, situated at Shijiazhuang near Beijing, as part of a general shutdown of polluting industry in China over the period of the Olympic games. In Addition of Vitamins and Minerals to Food, 2005: Health Canada's Proposed Policy and Implementation Plans . Ascorbate is categorized in ‘Risk Category A nutrients’ which for ‘‘those nutrients for which a UL was set but with a wide margin of safe intake; and those nutrients with a narrow margin of safety, but non-serious critical adverse effects’’. The level of additions set by health canada are Minimum of 3 mg or 5 % of RDI to be able to claim as "Source" and maximum fortification of 12 mg (20 % of RDI) to be claimed "Excellent Source". ↑ 1.0 1.1 "Vitamin C". Food Standards Agency (UK). สืบค้นเมื่อ 2007-02-19. ↑ 3.0 3.1 Higdon, Jane, Ph.D. (2006-01-31). "Vitamin C". Oregon State University, Micronutrient Information Center. สืบค้นเมื่อ 2007-03-07. ↑ McCluskey, Elwood S. (1985). "Which Vertebrates Make Vitamin C?" (PDF). Origins. 12 (2): 96–100. ↑ 6.0 6.1 6.2 6.3 "Vitamin C – Risk Assessment" (PDF). UK Food Standards Agency. สืบค้นเมื่อ 2007-02-19. ↑ , Wilson LG. The Clinical Definition of Scurvy and the Discovery of Vitamin C J Hist of Med1975;40-60. ↑ Meister A (1994). "Glutathione-ascorbic acid antioxidant system in animals" (PDF). J Biol Chem. 269 (13): 9397–400. PMID 8144521. ↑ , Nualart FJ, Rivas CI, Montecinos VP, et al. Recycling of vitamin C by a bystander effect. J Biol Chem 2003; 278:10128–10133. ↑ Gropper SS, Smith JL, Grodd JL. 2004. Advanced Nutrition and Human Metabolism. Fourth Edition. Thomson Wadsworth, Belmont, CA. USA. pp. 260-275. ↑ Bánhegyi G, Mándl J (2001). "The hepatic glycogenoreticular system". Pathol Oncol Res. 7 (2): 107–10. doi:10.1007/BF03032575. PMID 11458272. ↑ Harris, J. Robin (1996). Ascorbic Acid: Subcellular Biochemistry. Springer. p. 35. ISBN 0306451484. OCLC 34307319 46753025 Check |oclc= value (help). ↑ "How Humans Make Up For An 'Inborn' Vitamin C Deficiency". ↑ 18.0 18.1 R.D. Hancock & R. Viola. "Ascorbic acid biosynthesis in higher plants and micro-organisms" (PDF). Scottish Crop Research Institute. สืบค้นเมื่อ 2007-02-20. ↑ Venturi S, Donati FM, Venturi A, Venturi M. 2000. Environmental iodine deficiency: A challenge to the evolution of terrestrial life? Thyroid. 10 (8):727-9. ↑ Venturi S, Venturi M. 1999. Iodide, thyroid and stomach carcinogenesis: Evolutionary story of a primitive antioxidant? Eur J Endocrinol . 140:371-372. ↑ Challem, JJ, Taylor, EW. 1998. Retroviruses, ascorbate, and mutations, in the evolution of Homo sapiens. Free Radical Biology and Medicine. 25(1):130-132. ↑ Benhegyi, G. 1997. Ascorbate metabolism and its regulation in animals. Free Radical Biology and Medicine. 23(5):793-803. ↑ Proctor P (1970). "Similar functions of uric acid and ascorbate in man?". Nature. 228 (5274): 868. doi:10.1038/228868a0. PMID 5477017. ↑ Rumsey SC, Kwon O, Xu GW, et al. Glucose transporter isoforms GLUT1 and GLUT3 transport dehydroascorbic acid. J Biol Chem 1997; 272:18982–18989. ↑ James M. May, Zhi-chao Qua, Huan Qiaoa and Mark J. Kourya. Maturational Loss of the Vitamin C Transporter in Erythrocytes. Biochem Biophys Res Commun. 2007; 360:295-298. ↑ Levine M, et al. Vitamin C pharmacokinetics in healthy volunteers: Evidence for a recommended dietary allowance. Proc Natl Acad Sci USA. 1996; 93:3704–3709. ↑ "Jacques Cartier's Second Voyage - 1535 - Winter & Scurvy". สืบค้นเมื่อ 2007-02-25. ↑ Lind, James (1753). A Treatise of the Scurvy. London: A. Millar. ↑ 44.0 44.1 44.2 "Safety (MSDS) data for ascorbic acid". Oxford University. 2005-10-09. สืบค้นเมื่อ 2007-02-21. ↑ "Pitt History - 1932: Charles Glen King". University of Pittsburgh. สืบค้นเมื่อ 2007-02-21. In recognition of this medical breakthrough, some scientists believe that King deserved a Nobel Prize. ↑ "How Humans Make Up For An 'Inborn' Vitamin C Deficiency". ScienceDaily. Cell Press. March 21, 2008. สืบค้นเมื่อ 2009-02-24. ↑ Prockop DJ, Kivirikko KI (1995). "Collagens: molecular biology, diseases, and potentials for therapy". Annu Rev Biochem. 64: 403–34. doi:10.1146/annurev.bi.64.070195.002155. PMID 7574488. ↑ Kivirikko KI, Myllylä R (1985). "Post-translational processing of procollagens". Ann. N. Y. Acad. Sci. 460: 187–201. doi:10.1111/j.1749-6632.1985.tb51167.x. PMID 3008623. ↑ Rebouche CJ (1991). "Ascorbic acid and carnitine biosynthesis" (PDF). Am J Clin Nutr. 54 (6 Suppl): 1147S–1152S. PMID 1962562. ↑ Kaufman S (1974). "Dopamine-beta-hydroxylase". J Psychiatr Res. 11: 303–16. doi:10.1016/0022-3956(74)90112-5. PMID 4461800. ↑ Englard S, Seifter S (1986). "The biochemical functions of ascorbic acid". Annu. Rev. Nutr. 6: 365–406. doi:10.1146/annurev.nu.06.070186.002053. PMID 3015170. ↑ Tak PP, Zvaifler NJ, Green DR, Firestein GS. Rheumatoid arthritis and p53: how oxidative stress might alter the course of inflammatory diseases. Immunol Today 2000; 21:78–82. ↑ Goodyear-Bruch C, Pierce JD. Oxidative stress in critically ill patients. Am J Crit Care 2002; 11:543–551; quiz 552–543. ↑ Schorah CJ, Downing C, Piripitsi A, et al. Total vitamin C, ascorbic acid, and dehydroascorbic acid concentrations in plasma of critically ill patients. Am J Clin Nutr 1996; 63:760–765. ↑ Satoh K, Sakagami H. Effect of metal ions on radical intensity and cytotoxic activity of ascorbate. Anticancer Res 1997; 17:1125–1129. ↑ Muhlhofer A, Mrosek S, Schlegel B, et al. High-dose intravenous vitamin C is not associated with an increase of pro-oxidative biomarkers. Eur J Clin Nutr 2004; 58:1151–1158. ↑ 72.0 72.1 72.2 72.3 "US Recommended Dietary Allowance (RDA)" (PDF). สืบค้นเมื่อ 2007-02-19. ↑ 73.0 73.1 Milton K (2003). "Micronutrient intakes of wild primates: are humans different?". Comp Biochem Physiol a Mol Integr Physiol. 136 (1): 47–59. PMID 14527629. ↑ "Linus Pauling Vindicated; Researchers Claim RDA For Vitamin C is Flawed". PR Newswire. 6 July 2004. สืบค้นเมื่อ 2007-02-20. ↑ Cathcart, Robert (1994). "Vitamin C, Titrating To Bowel Tolerance, Anascorbemia, and Acute Induced Scurvy". Orthomed. สืบค้นเมื่อ 2007-02-22. ↑ "Vitamin and mineral requirements in human nutrition, 2nd edition" (PDF). World Health Organization. 2004. สืบค้นเมื่อ 2007-02-20. ↑ Higdon, Jane. "Linus Pauling Institute Recommendations". Oregon State University. สืบค้นเมื่อ 2007-04-11. ↑ Roc Ordman. "The Scientific Basis Of The Vitamin C Dosage Of Nutrition Investigator". Beloit College. สืบค้นเมื่อ 2007-02-22. ↑ "Vitamin C Foundation's RDA". สืบค้นเมื่อ 2007-02-12. ↑ Levy, Thomas E. (2002). Vitamin C Infectious Diseases, & Toxins. Xlibris. ISBN 1401069630. OCLC 123353969. Chapter 5 - Vitamin C optidosing. ↑ 83.0 83.1 Pauling, Linus (1986). How to Live Longer and Feel Better. W. H. Freeman and Company. ISBN 0-380-70289-4. OCLC 154663991 15690499 Check |oclc= value (help). ↑ WHO (June 4, 2001). "Area of work: nutrition. Progress report 2000" (PDF). ↑ Shenkin A (2006). "The key role of micronutrients". Clin Nutr. 25 (1): 1–13. doi:10.1016/j.clnu.2005.11.006. PMID 16376462. ↑ Rivers, Jerry M (1987). "Safety of High-level Vitamin C Ingestion". Annals of the New York Academy of Sciences. 498: 445. doi:10.1111/j.1749-6632.1987.tb23780.x. ↑ Simon JA, Hudes ES (1999). "Relationship of ascorbic acid to blood lead levels". JAMA. 281 (24): 2289–93. PMID 10386552. ↑ Douglas, RM; Hemilä, H (2005). "Vitamin C for Preventing and Treating the Common Cold". PLoS Medicine. 2 (6): e168. doi:10.1371/journal.pmed.0020168. PMID 15971944. ↑ Stone, Irwin (1972). The Healing Factor: Vitamin C Against Disease. Grosset and Dunlap. ISBN 0-448-11693-6. OCLC 3967737. ↑ 99.0 99.1 Rath MW, Pauling LC. U.S. Patent 5,278,189 Prevention and treatment of occlusive cardiovascular disease with ascorbate and substances that inhibit the binding of lipoprotein(a). USPTO. 11 Jan 1994. ↑ Hemilä H, Louhiala P (2007). "Vitamin C for preventing and treating pneumonia". Cochrane Database Syst Rev (1): CD005532. doi:10.1002/14651858.CD005532.pub2. PMID 17253561. ↑ 101.0 101.1 Hemilä H (2003). "Vitamin C and SARS coronavirus". J Antimicrob Chemother. 52 (6): 1049–50. doi:10.1093/jac/dkh002. PMID 14613951. ↑ "Nigeria: Vitamin C Can Suppress HIV/Aids Virus". allAfrica.com. 2006-05-22. สืบค้นเมื่อ 2006-06-16. ↑ Boseley, Sarah (2005-05-14). "Discredited doctor's 'cure' for Aids ignites life-and-death struggle in South Africa". The Guardian. สืบค้นเมื่อ 2007-02-21. ↑ Levy SE, Hyman SL (2005). "Novel treatments for autistic spectrum disorders". Ment Retard Dev Disabil Res Rev. 11 (2): 131–42. doi:10.1002/mrdd.20062. PMID 15977319. ↑ Evans JR (2006). "Antioxidant vitamin and mineral supplements for slowing the progression of age-related macular degeneration". Cochrane Database Syst Rev (2): CD000254. doi:10.1002/14651858.CD000254.pub2. PMID 16625532. ↑ Hemilä H, Koivula TT (2008). "Vitamin C for preventing and treating tetanus". Cochrane Database Syst Rev (2): CD006665. doi:10.1002/14651858.CD006665.pub2. PMID 18425960. ↑ "FDA OKs vitamin C trial for cancer". Physorg.com. January 12, 2007. สืบค้นเมื่อ 2007-04-06. Federal approval of a clinical trial on intravenous vitamin C as a cancer treatment lends credence to alternative cancer care, U.S. researchers said. ↑ "Vitamin C (Ascorbic acid)". MedLine Plus. National Institute of Health. 2006-08-01. สืบค้นเมื่อ 2007-08-03. ↑ "Toxicological evaluation of some food additives including anticaking agents, antimicrobials, antioxidants, emulsifiers and thickening agents". World Health Organization. 4 July 1973. สืบค้นเมื่อ 2007-04-13. ↑ Cook JD, Reddy MB (2001). "Effect of ascorbic acid intake on nonheme-iron absorption from a complete diet" (PDF). Am. J. Clin. Nutr. 73 (1): 93–8. PMID 11124756. ↑ Naidu KA (2003). "Vitamin C in human health and disease is still a mystery? An overview" (PDF). J. Nutr. 2 (7): 7. doi:10.1186/1475-2891-2-7. PMID 14498993. ↑ Javert CT, Stander HJ (1943). "Plasma Vitamin C and Prothrombin Concentration in Pregnancy and in Threatened, Spontaneous, and Habitual Abortion". Surgery, Gynecology, and Obstetrics. 76: 115–122. ↑ Wilson JX (2005). "Regulation of vitamin C transport". Annu. Rev. Nutr. 25: 105–25. PMID 16011461. ↑ "The vitamin and mineral content is stable". Danish Veterinary and Food Administration. สืบค้นเมื่อ 2007-03-07. ↑ "National Nutrient Database". Nutrient Data Laboratory of the US Agricultural Research Service. สืบค้นเมื่อ 2007-03-07. ↑ "Vitamin C Food Data Chart". Healthy Eating Club. สืบค้นเมื่อ 2007-03-07. ↑ "Natural food-Fruit Vitamin C Content". The Natural Food Hub. สืบค้นเมื่อ 2007-03-07. ↑ Chatterjee, IB (1973). "Evolution and the Biosynthesis of Ascorbic Acid". Science. 182: 1271–1272. doi:10.1126/science.182.4118.1271. ↑ Irwin Stone, PC-A (1979). "Eight Decades of Scurvy". Orthomolecular Psychiatry. Vol. 8, (Number 2): 58–62. ↑ Clark, Stephanie, Ph. D (8 January 2007). "Comparing Milk: Human, Cow, Goat & Commercial Infant Formula". Washington State University. สืบค้นเมื่อ 2007-02-28. ↑ Roig MG, Rivera ZS, Kennedy JF. A model study on rate of degradation of L-ascorbic acid during processing using home-produced juice concentrates. Int J Food Sci Nutr. 1995 May;46(2):107-15. ↑ Hitti, Miranda (2 June 2006). "Fresh-Cut Fruit May Keep Its Vitamins". WebMD. สืบค้นเมื่อ 2007-02-25. ↑ The Diet Channel Vitamin C might be the most widely known and most popular vitamin purchased as a supplement. ↑ "The production of vitamin C" (PDF). Competition Commission. 2001. สืบค้นเมื่อ 2007-02-20. ↑ Patton, Dominique (2005-10-20). "DSM makes last stand against Chinese vitamin C". nutraingredients. สืบค้นเมื่อ 2007-02-20. ↑ , Addition of Vitamins and Minerals to Food, 2005: Health Canada's Proposed Policy and Implementation Plans. Pauling, Linus (1976). Vitamin C, the Common Cold, and the Flu. W H Freeman & Co. ISBN 0716703610. OCLC 2388395. Clemetson, C.A.B (1989). Vitamin C. Boca Raton, Florida: CRC Press. ISBN 0-8493-4841-2. OCLC 165609070 17918592 Check |oclc= value (help). Monograph - Volumes I, II, III. Naidu KA (2003). "Vitamin C in human health and disease is still a mystery? An overview". Nutrition journal. 2: 7. doi:10.1186/1475-2891-2-7. PMID 14498993. หน้านี้แก้ไขล่าสุดเมื่อวันที่ 27 ตุลาคม 2555 เวลา 22:57 น.